With consumer use of smartphones growing by the day, it’s no surprise that users are taking them into the workplace as well. Thousands of people already use their personal smartphones for work-related tasks like checking email and calendars when they’re away from their desks. And many wish they could do more with their smartphones, given their myriad functions and applications. 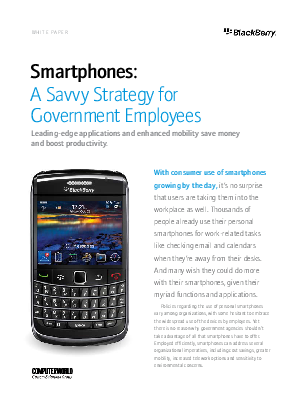 Policies regarding the use of personal smartphones vary among organizations, with some hesitant to embrace the widespread use of the devices by employees. Yet there is no reason why government gencies shouldn’t take advantage of all that smartphones have to offer. Employed efficiently, smartphones can address several organizational imperatives, including cost savings, greater mobility, increased telework options and sensitivity to environmental concerns.